Klovićevi yard is located in a building whose construction began in mid-17th century, but shortly afterwards partly destroyed by fire and was later restored, rebuilt and reconstructed. A former Jesuit monastery, which until then had been offices and archival storage, the most radical changes experienced in the period since 1974 until 1983 when it was converted into a representative space for exhibiting art. Since then, the Gallery held many exhibitions of paintings and sculptures by celebrated international and Croatian artists. Gallery space and a very nice atrium are suitable for meetings, receptions and banquets. Former Jesuit complex owes its beauty and plastic – decorative elements on its exterior facade, but also those backyard. The stone portal in the west facade of its rustic rectangular chamber of the Renaissance masters, while the second portal, today’s entry into the gallery, the work of the High Baroque period from 1783 / 4 year. 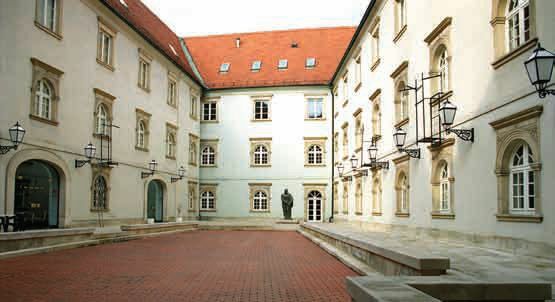 Synthesis of the Renaissance and Baroque periods resulted in a very harmonious solution, where the baroque portal has become the trademark Klovićevi yard. INSIDE VENUE: Klovićevi yard willingly ceded their premises for holding receptions, marketing events, concerts, conferences, press conferences and other similar events. For this purpose, it is possible to use some space: the atrium, foyer, café, lecture room, exhibition space. The Gallery and its very eloquent Atrium are the perfect place for conducting meetings, receptions and banquets.